This 4-year (minimum) full-time course is offered by the Faculty of Engineering and Surveying. Part-time study may be approved by the Academic Dean in exceptional circumstances only. With the exception of Computer Systems Engineering, the first two years of the course may be studied in either Hobart or Launceston. The remainder of the course must be completed in Hobart. If students are entering first year Engineering in either Hobart or Launceston, they must have met the University admission requirements including a TCE Satisfactory Achievement (SA) result or higher in Mathematics Stage 2 (MT841) and Physics (PH866). In exceptional circumstances, if students narrowly fail one of the TCE prerequisites they may apply to the Academic Dean for special consideration. At the Academic Dean's discretion a Tasmanian TAFE Certificate in Civil, Mechanical or Electrical Engineering may be accepted as an alternative prerequisite for admission to the Bachelor of Engineering course with advanced standing. Interstate or overseas qualifications, which are deemed equivalent by the University, may also be accepted. * to produce well rounded graduates who can develop their professional and managerial skills in their places of employment. The engineering degree is interesting and challenging, requiring motivation and commitment from the student. In its final stages students work and become familiar with the very latest developments in the various disciplines. Students both in Hobart and Launceston (except those who wish to specialise in Computer Systems Engineering) take a common first year course. This gives a breadth of subjects which enable students to select the area of engineering to which they are best suited and in which they wish to specialise. If students wish to specialise in Computer Systems Engineering (CSE) they must undertake a different first year course, offered only in Hobart, which includes major components of computer science. The standard routes of progression through each of the four years to these specialisations are shown in Figure 1, on the following page. A major feature of the engineering courses is the emphasis placed on laboratory work; and students will be required to write regular reports on their work. The design classes provide them with opportunities to learn the techniques of developing safe and reliable designs. In the fourth year, each student undertakes an individual project which involves an analysis of requirements, feasibility study, and design and development usually resulting in a prototype. For both the laboratory and the design classes, extensive use is made of computers. Engineering students are also required to undertake a recognised first-aid course and to complete a prescribed amount of industrial experience work in the vacations. This work is usually arranged through the Faculty of Engineering and Surveying, and students are paid by their employers at the appropriate award rate. The Bachelor of Engineering is accredited by the Institution of Engineers Australia as providing qualification for Graduate membership of the Institution. The electrical engineering specialisations are also recognised by the Institution of Electrical Engineers as qualification for Associate membership. The computer systems engineering specialisation is also accredited by the Australian Computer Society for graduate entry. Specimen courses are outlined below. Students should note that their choice of units should conform with the specimen courses, unless otherwise determined by the Academic Dean. If students have attempted all or part of an Examination previously they will not be permitted to count units with an overlapping content. 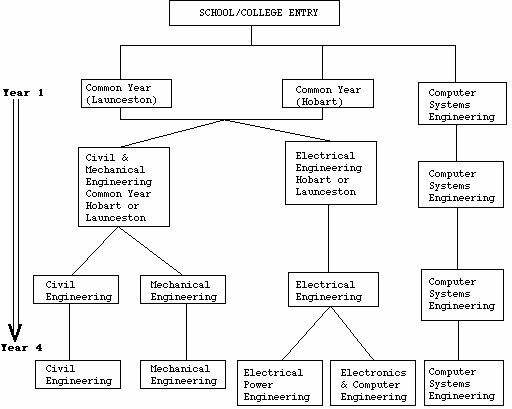 If students wish to specialise in other branches of Engineering (e.g. Aeronautical, Agricultural, Chemical, Manufacturing, Maritime, Materials, Mining, Naval Architecture, Petroleum), it is generally possible for them to start their studies at the University of Tasmania and later transfer to an institution offering the course. If this is the student's intention, it is important that they see the Academic Dean before starting their University studies as it may be necessary to follow a specially prescribed course. In certain circumstances, the Faculty of Engineering and Surveying may grant status in subjects of the BE degree course to students who have completed equivalent work in other institutions. All such cases are treated on their merits. Special admission conditions apply to the acceptance of overseas students. Approved diplomates of certain overseas polytechnics may be granted advanced standing of up to four semesters toward the four year Bachelor of Engineering degree. Special courses for overseas students with advanced standing are outlined in the Specimen Courses under the heading Overseas Students with Diplomas in Civil, Mechanical or Electrical Engineering. Further details are available from Mr Peter Watt, Department of Electrical & Electronic Engineering, Hobart.